Steve appreciated art, but was never a collector, certainly not an art connoisseur. But when he looked online at items listed for the silent auction at the Annual 31st Gifft Hill School Auction on St. John where we spend winters, he was captivated and rushed to show me. 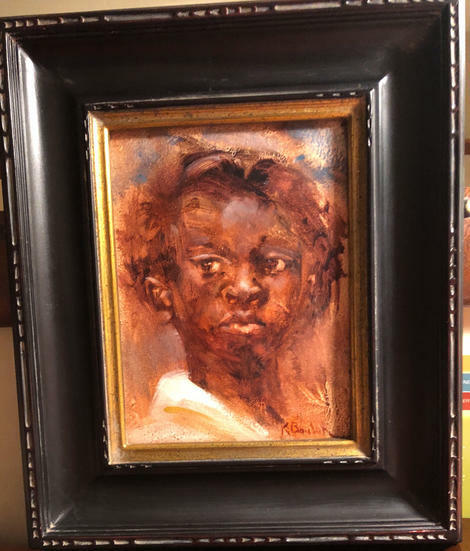 The portrait of who we guessed was a young adolescent West Indian girl was small yet compelling. Her eyes were turned to her right where she stared with pursed lips and slightly flared nares. She held her head high. I saw vigilance in her gaze. I wanted to protect her. The painting was titled, “Seeing Clearly.” Steve returned to the portrait several times before the auction, which was to benefit a private school on St. John we had witnessed during the past thirty years grow from tiny seeds to a full campus for children of all ages on island. The school and its students are as generous to the community as the community is to it. A real love story about children, community, learning, and a tiny island. The painting was the work of Kimberly Boulon, who donated it and several other larger paintings. “Kim” is an impressive artist whose own love for St. John can be seen in the strokes and light in her work. All of the proceeds, not just a percentage, which is fairly common practice, from Kim’s works were to go to Gifft Hill School. More love. We arrived at the auction, greeting the Digiacomos, who had generously included us at their table with other island friends. Steve and I rushed to the Silent Auction and found “Seeing Clearly,” who was more captivating in person. Those eyes. What was she looking at? What had she seen? Why was she so alert? What had happened in her young life? We made a small bid and tried to leave “Seeing Clearly” behind, but we could not abandon her. We were both drawn to this picture, which had now touched us like no other piece of art. We began our own vigil, stalking with our eyes the few other bidders who seemed to want what we were now calling, “our girl.” In a last minute stealth maneuver, I dashed from the dinner table where we were now seated and returned to the silent auction room. I concealed myself behind a nearby pillar and when the last main competitor finished her final offer, I darted to the painting and upped the bid by twenty-five dollars just before the announcement that the silent auction had ended. At home in our tiny cottage, we giggled about where we should hang our new fine “aht,” inserting our Boston accents into the silliness, the magic of the night. After several attempts, we found a spot for our girl, where she could be seen easily. I can’t ever remember a painting drawing my eyes to it so often before. We were clearly smitten with the addition to our family. When it came time to return home to Cape Cod, we agonized. Should we leave her behind where life was familiar? Or did we bring her home with us to spend the summer on the Cape? How would she fare on the flight? Would she be okay alone while we were gone? Steve decided she belonged on St. John and could watch over our home until we returned in November, a plan that made sense to me. Until an unthinkable category five hurricane named Irma terrorized our island, only to be followed closely by another category five hurricane called Maria, Coral Bay, our island village, had felt the brunt of the storms. Once we were assured neighbors and friends were safe, we wondered how was our girl? Why had we left her behind? In the weeks that followed, we learned the island had been splintered and looked as if a bomb had exploded. Shock, sadness, and a little self-pity set in. Why when we had just figured out how to spend the final chapter of our lives had this happened? And why, oh why, did we leave our girl behind? An email string connected me to Kathy, a neighbor, who had moved into the cottage above us after we had left for the summer. She offered to have her husband, who had stayed on island through it all, check our cottage. I told her there was only one thing we really cared about and that was our girl and that Kathy was the best neighbor I had never met. I had been having nightmares about St. John in which “Seeing Clearly” was floating upside down in a few feet of filthy water. When the photo of her sitting on our table looking in decent shape arrived by email, I choked up. When I learned Mike Lachance was coming up to see his wife, Kathy, in New Hampshire for a week and was bringing our girl with him, I cried. When we met Kathy and Mike last week, Steve and I felt like we were being reunited with family. Because we were. St. John is affectionately known as “Love City.” An island where a community of people have chosen to live together in isolation and harmony where differences are embraced and where “One Love” is more than a song. Where “Love Thy Neighbor” is a practice, not a slogan. Where generosity is inherent. The Gifft Hill School, where we first found our girl, opened its doors to all island children just days after the storm when it was evident the public schools were damaged. A real circle of love.Love. That’s the thing about St. John that is difficult to convey in words. But maybe you can in a painting. Has a piece of art ever touched your life and become a part of your story?